While none of the Azores islands see huge numbers of tourists, the majority of visitors spend their time on Sao Miguel. The other eight islands have plenty to offer, however, including Terceira. 90 miles northwest of Sao Miguel, it is one of the larger islands in the archipelago and has its own international airport. 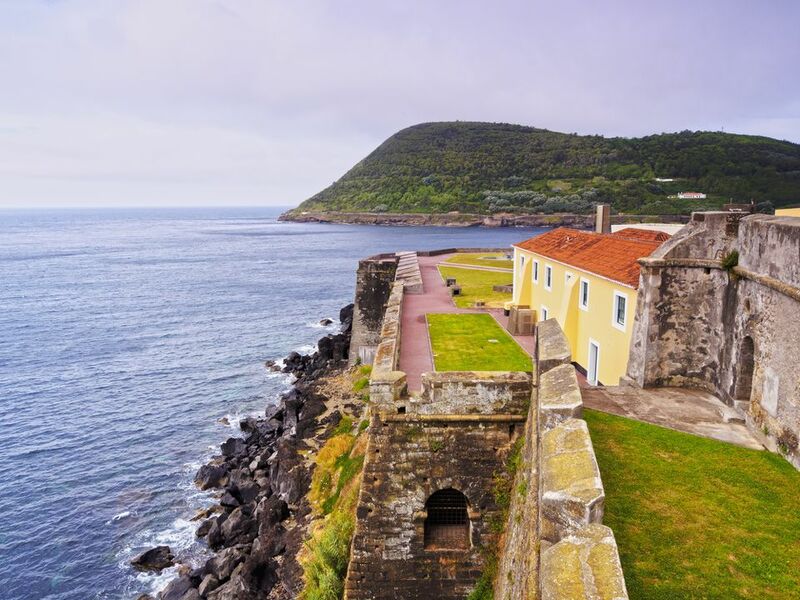 With planes arriving from North America and mainland Portugal, as well as inter-island flights, it's surprisingly easy to visit, and makes for a logical stopover between the US and Europe. With sandy beaches, dozens of stunning viewpoints, and even the ability to explore inside an extinct volcano, we'd recommend at least three full days on the island. Here are the top 12 things to do while you're there. Close to the airport, the attractive town of Praia da Vitória is known for its colorful buildings, the remains of its old city walls, and a sandy beach alongside the marina. Expect to share it with plenty of other sun worshippers during summer, but you'll have the beach largely to yourself at other times of year. Changing rooms and a bar/restaurant are available in warmer months, and while the Atlantic waters will be chilly no matter when you're there, Terceira's temperate climate makes for sunbathing opportunities throughout much of the year. The hilltop viewpoint of Miradouro do Facho lies just outside Praia da Vitória, and is the perfect spot to take photos of the town, harbor, and surrounding countryside. It's easily accessible by car, with plenty of parking, or there's a long, steep staircase that starts on the edge of town if you're feeling energetic. Once used as a lighthouse, with a fire being set every night to warn passing ships away from the rocky coastline, there's now a large statue of the Virgin Mary at the top. As with many high spots on the island, expect plenty of wind, even if it's relatively calm down below. As with other parts of the Azores, Terceira is best experienced with your own set of wheels. Public transport is limited and aimed at the needs of locals, so is unlikely to run when or where you want it to. A well-paved road circles the island, making it straightforward to get between the main towns and many points of interest. Other roads tend to be more narrow and winding, especially heading up into the mountains, but are usually still in good condition. Several companies rent cars to visitors—like much of Europe, small cars with a manual (stick) transmission are the standard option. Enquire well in advance if you prefer one with an automatic gearbox. If you're comfortable on two wheels, the short distances and winding roads are ideal for exploring by motorbike, with scooter rentals easily available. Jutting out into the ocean outside Angra do Heroísmo, most of the Monte Brasil peninsula has been designated as a natural reserve. The remains of a long-extinct volcano, the peninsula is covered in a thick forest that's full of flowers in spring, and has a hiking trail that leads to the summit and viewpoint. You can also drive there if it's muddy underfoot, or you didn't pack your walking shoes. At the top, you'll find stunning views, along with a large memorial cross commemorating the discovery of the island in 1432, and a few decommissioned artillery pieces courtesy of the nearby São João Baptista fort. The fort is still occupied by the Portuguese army, as it has been since the early seventeenth century, and you can see the inside by joining one of the guided tours that typically run every hour. Probably the biggest highlight of a visit to Terceira is the Algar do Carvão, a lava tube in the middle of the island. With a vertical drop of 150 feet from the mouth of the cavern to its floor, and a further 150-foot descent to the rainwater-fed lagoon that marks its deepest point, it's a rare opportunity to walk inside an extinct volcano, and a must-see for most visitors. Opening hours vary depending on the time of year, with daily operation during summer months, so check the website for current information when planning your visit. Tickets cost 6 to 9 euros per adult to visit one or two caves, with accompanying children under 12 entering free. At 3350 feet high, the summit of Serra de Santa Bárbara in the west of Terceira is the highest point on the island. On clear days, visiting the lookout ensures stunning views in every direction, and if you're lucky, you'll even be able to spot some of the other Azorean islands. As with other viewpoints, however, there's little point visiting if the top is covered in cloud. There's a small interpretive center just before the main access road, offering guided tours and plenty of useful information about the mountain and surrounding area. While most visitors drive to the viewpoint, it is also possible to walk—look out for signs pointing the way to the trilho turistico in Santa Bárbara village. The climb is fairly strenuous, so be sure to wear appropriate footwear and take warm, waterproof clothing, even in summer. You'll be on the mountain for at least 3-4 hours, and conditions change quickly. Angra do Heroísmo is the capital and largest city on Terceira, and where the majority of visitors base themselves. The town center was listed as a UNESCO World Heritage site in 1983, and a few minutes spent exploring the beautiful, brightly-colored buildings makes it easy to see why. If the weather isn't good, there are plenty of museums, galleries, and other indoor attractions worthy of your attention, but when the sun's out, simply wandering through the cobbled plazas and down the narrow streets with no particular plan is highly rewarding. If you've been walking around Angra do Heroísmo for a while and your feet need a break from the cobbled streets, relax for a while on a bench in the Duque da Terceira garden. This small but attractively-designed botanic garden in the center of town is filled with trees, flowers, and shrubs from all over the world. There's a small cafe on the eastern edge of the garden, and several other places to eat and drink just outside. Once you've got your energy back, follow the path to the stairs behind the garden that lead up to the Alto da Memória, a viewpoint with fantastic views over the town, beach, and harbor area. In the east of the island, and rising up steeply from the surrounding countryside, the top of Serra do Cume lies 1800 feet above sea level. A pair of viewing platforms provide truly spectacular views over the villages and farmland of much of Terceira, at least on clear days—make sure you can see the top before deciding to drive up there, as you'll see very little otherwise! While several wind turbines are dotted around the mountainside, they don't obstruct the best photo opportunities. Don't be surprised if you share the experience with a few friendly cows, as they're often found grazing along the access road. The distinctive churches on Terceira, and indeed throughout the Azores archipelago, are one of the island's most notable features. The oldest example can be found in the center of São Sebastião—this small chapel was first built around 1455, and subsequently rebuilt several times over the centuries. It's made particularly interesting by the remains of several medieval frescoes adorning the side walls, and while there isn't much left of a few of the artworks, some are still largely intact, with preservation efforts paying dividends. Right on the southeast tip of Terceira sits Farol das Contendas, a lighthouse that has been in continuous operation there since 1934. Views from its isolated location are impressive, over the rocky cliffs and shoreline and out to the vast ocean beyond. The M509 road that leads to the lighthouse is a more scenic alternative to the main route between the towns of Porto Judeu and São Sebastiã, with several small bays and viewpoints to stop at along the way. Perhaps surprisingly for an island chain in the middle of the Atlantic, the Azores has a burgeoning local wine scene due to its fertile rocky volcanic soil and temperate climate. The best place to taste and learn more about the wines in Terceira is at the Museu do Vinho in Biscoitos. This family-run vineyard has been in operation since 1900, with the small museum featuring several items of traditional wine-making equipment. Tours typically take around 25 minutes, explaining the history of wine in the area, and there's plenty of opportunity to try whatever's open and buy a bottle or two to take home.